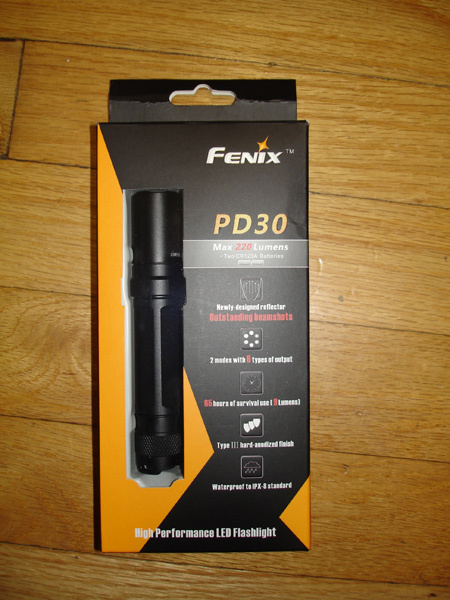 A couple of months ago, Michelle Lei, the marketing supervisor for Fenix Lights, sent me a courtesy sample of their new PD30 flashlight to test. While this isn’t a bike-specific headlight, it can easily be pressed into service as one. The light itself is solidly-made and feels like it…quality materials and finishing. All parts are sealed with o-rings, so it is weatherproof (I tested that by being caught in a couple of late-season downpours…no problems with the light). 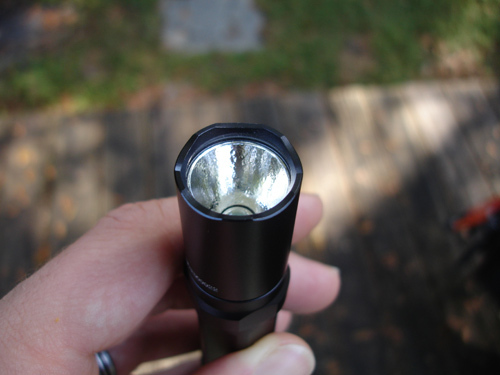 The light is compact, so it is easy to stow away in a pocket or bag when not in use. I’m concerned that the wide spread of light may shine into oncoming motorists’/cyclists’ eyes — some of the more expensive bicycle lighting systems have lenses and vertical cutoffs that help eliminate that possibility, and again the Fenix really can’t be compared to them. No matter…I haven’t received any complaints from anyone yet! The other “turbo mode” setting is the flashing strobe…and this is the setting I use most often. 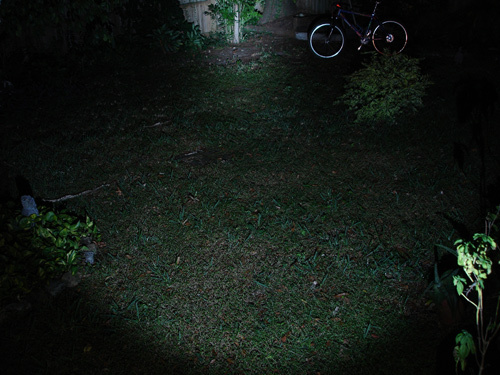 The Fenix PD30 flashes at somewhere upwards of 120 flashes per minute (probably closer to 200), and it flashes with the full 220 lumen wallop. The flash is so bright that it will illuminate a reflective street sign from two blocks away in DAYLIGHT. I use this setting in the mornings on my way to work and it definitely gets motorists’ attentions…nobody is turning in front of me! At night, the intensity and speed of the flashing can be disorienting as it lights up everything around me in stark relief. I used the light during a recent Critical Mass ride, and one of my fellow riders said, “wow, that light is obnoxious!” It gets attention, that’s for sure. Fenix indicated that they may develop a mounting system for this light for bicycle/sports use. 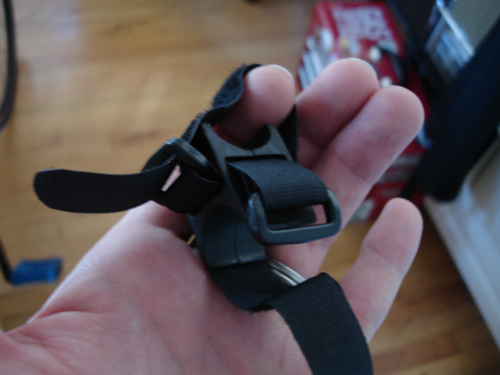 Since it didn’t come with such a mount, I used a Twofish Unlimited “Lockblock” with great success. The light’s body is hexagonal, so it won’t slip in the rubber Twofish cradle. Using such a setup means that the light is quite portable and can go from bike to bike without a fuss. And, it doesn’t take up much handlebar real estate. My only real gripe with the PD30 is the battery situation…the light uses two CR123A batteries, and they’re not as cheap and as easy to find as AA/AAA sizes. Also, good-quality rechargeable batteries in the CR123A size can be hard to come by. Luckily, I found some great online deals on disposable batteries for this light. Battery life wasn’t an issue with the light, at least — I used the strobe setting every workday for 3 weeks (25 minutes per ride) without seeing any degradation in the strength of the light. I haven’t been able to test Fenix’s claims of other runtimes as I don’t ride so much at night anymore (no more late hours at the library!!). Overall, I like the light — it does what I need it to do and it provides enough light to handle fast rides on dark streets. 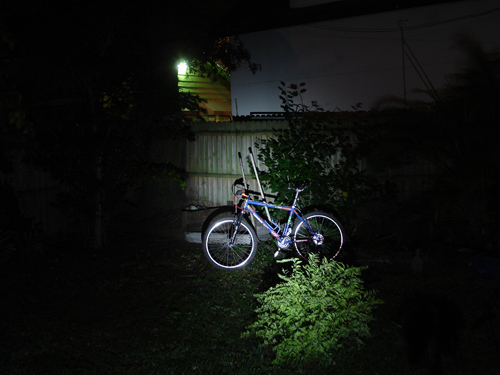 I don’t recommend the turbo-mode strobe setting at night, though — there’s another lower-intensity flashing setting built into the light that is a bit more friendly on the eyes. 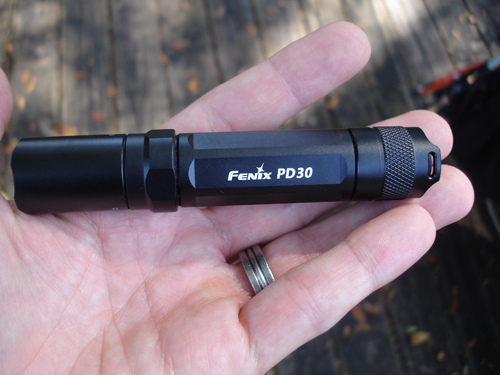 The Fenix PD30 retails for around $60.00 USD…that’s a pretty good deal for a strong, well-made light that would be a valuable addition to the nighttime commuter’s arsenal. Check out Fenix’s full line of lights for every possible need by visiting their website.